The Center for Health Administration and Policy Studies, Faculty of Public Health, Universitas Indonesia (CHAMPS FPH UI), was established in 2006 with an aim to get involved in health system development in Indonesia by providing research, training, public discussion, conference, and conceptual assistance regarding health issues. CHAMPS FPH UI has a program that focuses on hospital issues, namely Hospital Management Program (HMP). It consists of many events such as training, seminar, and conference. One of the events is an annual event, known as Hospital Administration Conference (HAC). After successfully conducting the first and second HAC, CHAMPS FKM UI brought HAC to a wider scope that targeted international speakers and participants and was named as the 1st International Conference of Hospital Administration (ICHA). Following that, in 2017, CHAMPS FKM UI organized the 2nd International Conference of Hospital Administration (ICHA) in collaboration with the Directorate of Research and Community Engagements (DRPM) and the Graduate Study of Hospital Administration, Universitas Indonesia. Nowadays, along with technology improvement and globalization, health issues have grown to be more complicated and reach the wider area of intervention. The public is able to gain knowledge about their health through books, the Internet and other media. It drives public’s need and demand for better access, quality, and cost in healthcare. In order to survive, hospitals must compete to provide what public need. On the other hand, this demand would require more resources to fulfil. Due to limited resources, healthcare has to be managed effectively and efficiently. To take care of this issue, healthcare should find new methods or new invention to give better access and quality of care with affordable cost. Thus, academia and professionals are challenged to make new innovations in healthcare. Based on these issues above, the 2nd International Conference on Hospital Administration (ICHA) presented a theme, ‘Current and Future Hospital Needs: Better Insights on Innovation to Answer Hospital Administration Challenges’. The purpose of this event was to gather all of healthcare and hospital stakeholders to discuss strategies in developing the best quality of hospital services, so that we could build a broader and comprehensive understanding related to the current and future issues in hospital management from various perspective. Participants who are involved in the International Conference of Hospital Administration (ICHA) were professionals from hospital field, academia, public health officer, and non-government organization in health. About 133 people attended the Conference on Day 1 (1st November 2017) and about 103 on Day 2 (2nd November 2017). A total of 99 papers, consisting of 37 oral presentations and 62 poster presentations, were presented in the conference. 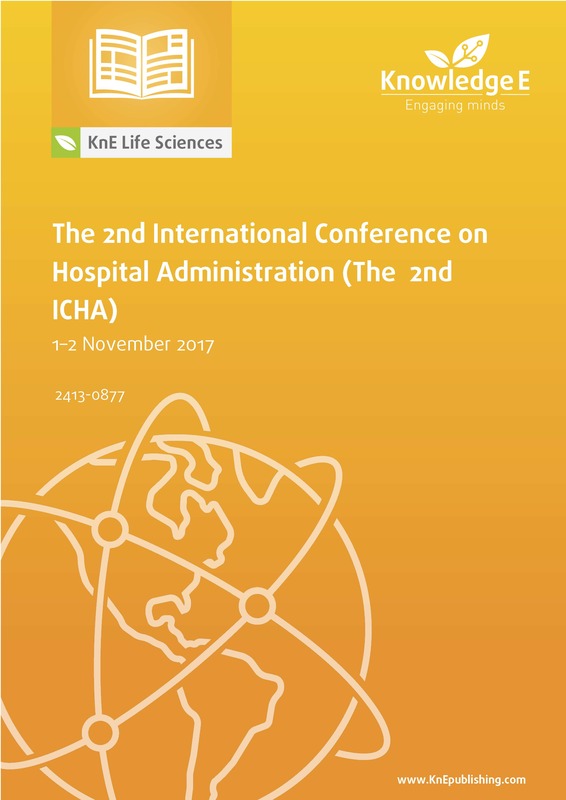 Indexing: The 2nd International Conference on Hospital Administration (The 2nd ICHA) Conference Proceedings are indexed in Web of Science (by Clarivate Analytics, formerly Thomson Reuters and ISI).